This procedure details the extra steps needed to install the InventoryControl v7 batch mode program to the WDT92 mobile device over a data cable. 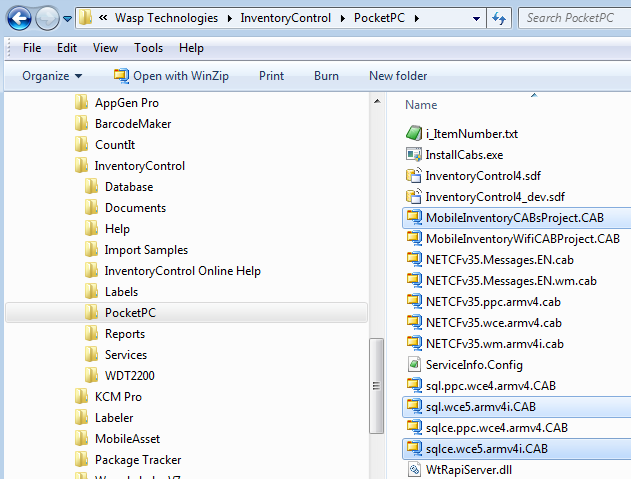 Connect the device via USB to the InventoryControl client PC, so that it shows as connected in Windows Mobile Device Center. If needed, troubleshoot with procedures documented elsewhere. Select the following files. 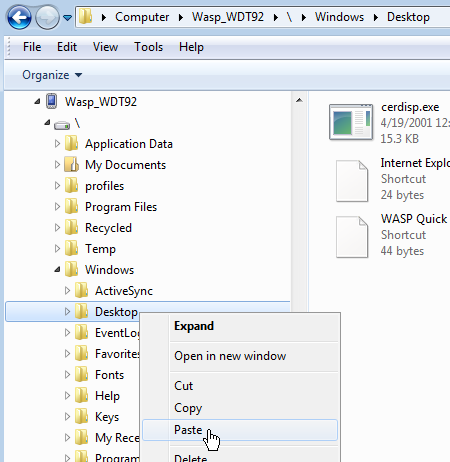 (To select more than one file at a time: Click the first file, then hold Ctrl on the keyboard and click the other two files.) Then right-click & copy. You should see three corresponding icons appear on the device's desktop screen. Double-tap each CAB file mentioned above; the order of installation does not matter. 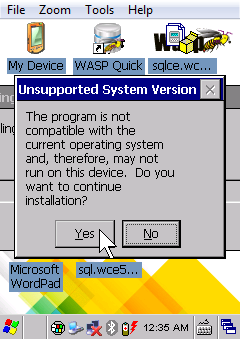 Tap Yes to continue on the message about "Unsupported System Version". Repeat the process until all 3 files are completed. You should see the files above are gone from the desktop, and the InventoryControl icon has appeared, but it's not ready to run yet. Run InventoryControl (on the PC). Click Mobility, Windows Mobile/CE (Batch). 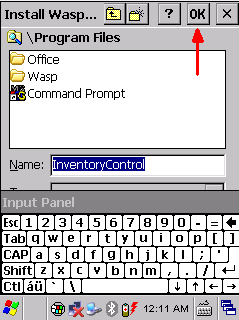 Click No on the message "The InventoryControl program does not exist on the mobile device. Would you like to install it now?". Then follow the "Create Mobile Database" procedure as usual. When this process is completed, InventoryControl on the mobile device should start up and prompt for credentials. It is ready to use.